Almost a month ago I put out apples on my obelisk to see if any birds would feed on them. A week later and I had video footage of a female blackbird eating them. 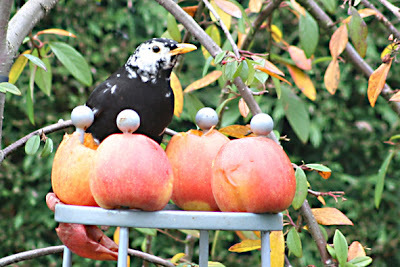 Perhaps you are wondering if I continued putting apples out and if any other birds have taken interest in them. Well, the answers are yes and yes! Starlings have now discovered this food source but then again they are pretty sharp when it comes to finding food! I haven’t any photos of them yet although perhaps a video would be more entertaining with them. However the photos above were taken rather quickly through my window when I spotted a partial albino male blackbird being supervised by a female blackbird from the branches above. Partial albino blackbirds visit my garden every day and the one shown above I do believe has the whitest head of feathers of all those that visit. I would love to get photos of this bird from outside but it is very quick to fly off if I am outside. In contrast, I have noticed that the female blackbirds are quite happy to carry on feeding on the ground if I walk past them. Festive Cheer? Perhaps you are wondering about the title of this post. Well, I really enjoy receiving comment on my posts and often get told interesting and funny stories – I just had to share this one. 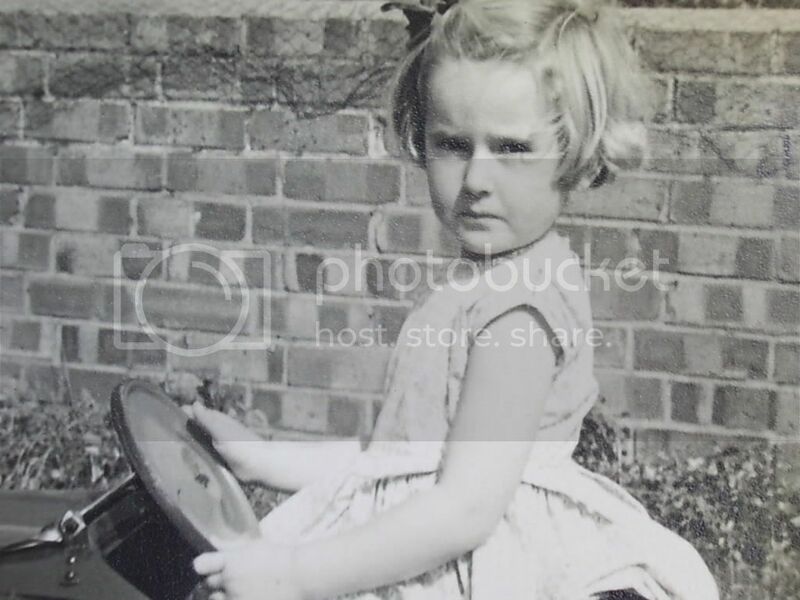 Thanks, Wildlife Gardener for telling me about your experience in feeding apples to the birds: “It reminded me of when our boys were young and we had a surfeit of apples after Halloween one year. A flock of fieldfares flew down each day to the roof of the garage where we'd placed the apples. They gorged themselves and staggered about quite tipsy on the cidery mead :) “. 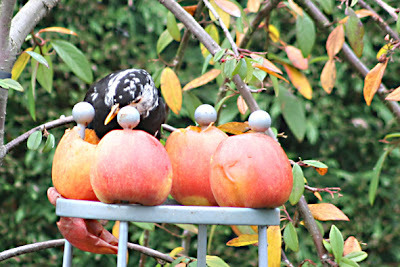 I laughed when I read that - it had never occurred to me that the birds could get tipsy with the apples! Perhaps that was why the female blackbird was on watch above. Ahh but the ones she will really need to be on watch for will definitely be the starlings and if they do get tipsy I hope I catch them on camera! The photos above were taken in my garden on 12th December 2007. Have a good time, Shirl! 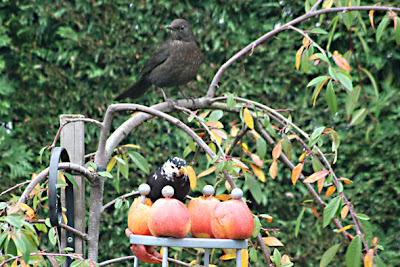 I watched the blackbirds eating apples in my garden yesterday... but I must admit they weren't as handsome as yours! We don't have any albinos... just scruffy "black" birds. It was a real treat to see your multi-coloured ones! He's gorgeous. The one I used to have coming here disappeared at the end of last summer. I've an awful feeling the hawk may have got him. He only had white on his cheeks and a couple in the wings.